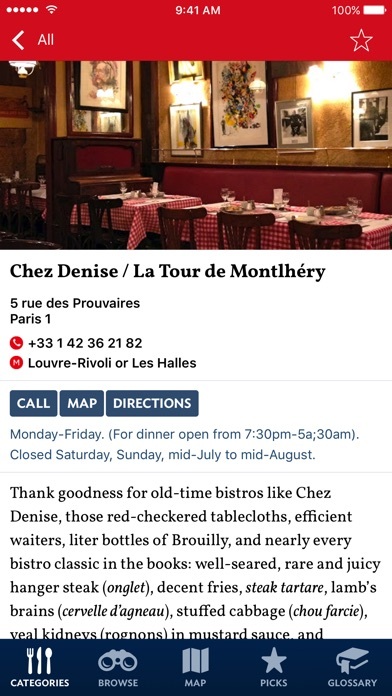 Dorie Greenspan, author of Dorie’s Cookies and Around My French Table FEATURES • Discover more than 500 of the city’s ultimate culinary destinations, tested by Patricia and her team and regularly updated with detailed dependable commentary. 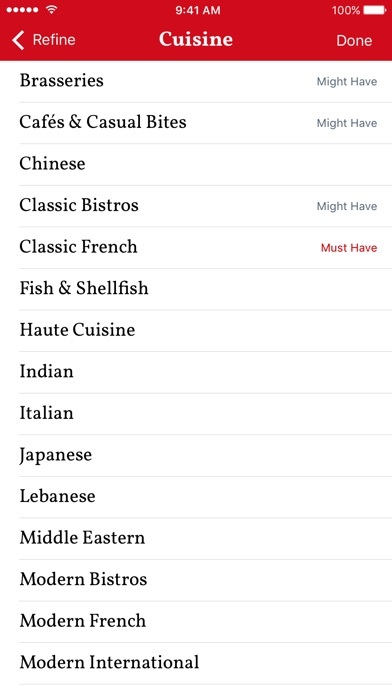 • Search by category using a filter to refine your search by cuisine type, neighborhood, details such as Michelin stars or gluten-free, atmosphere, price, and culinary specialties. • Browse the app contents by category or neighborhood, or by restaurant specifics such as price, cuisine type, specialties or restaurant details like vegetarian-friendly or Michelin-star rating. 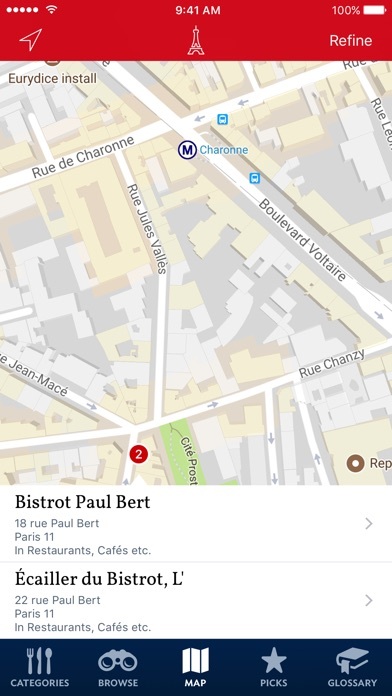 • A map of Paris shows the location of all the addresses in the guide (use the filter to limit the addresses to those you are interested in). An offline geolocator allows you to see your location even when you’re not connected to the internet. 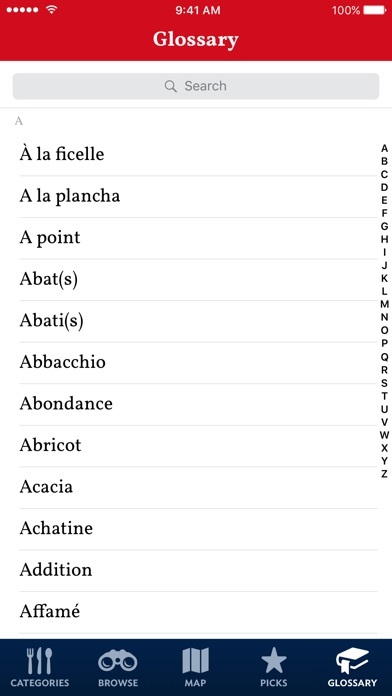 • A-Z glossary of French culinary terms to help translate menus on the spot. • Bookmark your favorite addresses, and access Patricia’s current favorites and seasonal recommendations in the Picks section. • English language only. This updated version is beautiful and very functional. Even when not online, the map is accurate and useful. It made my most recent trip to Paris a resounding success, taking me to local haunts and new neighborhoods I would not have visited otherwise. Just like having a trusted local guide with you at all times. Like having PW next to you while strolling Paris. Great App, Great Taste, Another winner from my favorite Foodie Guru. This is an embarrassment that Patricia Wells should either correct with a complete overhaul or remove from the Apple App store. I purchased it, downloaded it, have updated it, and it doesn’t work. It’s a mess. Her book was well done originally, and if she’d spent the money necessary to hire a competent app developer and update it properly, it would be a help to Paris visitors, but this is sad. This is really more of a stripped down mobile book than an app. It's got many (not all) of the great write ups in the Wells book, but no real functionality. Sorting is crude and the map doesn't geo-locate, but if you're out on the town and know where you are, you can manually zoom on the map to find a recommended place near you. If you're the type who plans every meal ahead of time, just get the book or digital book, as you'll likely enjoy it more. Do not purchased this app. You cannot search for restaurants. You must scroll through and alphabetized list of restaurants with no guidance. This is a big disappointment from our 1999 version of food lovers guide to Paris which we have used time and time again in Paris. We carried Patricia Wells 3rd edition of Food Lovers Guide to Paris all over the city in 1995. Every recommendation was great. Twenty years later we're going back, so I bought the app. I searched for 4 of our favorites. All are still open, with web sites, FB pages, etc. Nothing. No listings in this app. 0 for 4. We'll bring the book. The map does not work on iPhone 6 plus - all pins on all the time. GPS probably won't work, but I don't know if I'll even bother to find out. This app is a waste of time. Patricia Wells RIP. It's too bad your good name is being abused with this lousy app. This does not work on the iPad. Cannot scroll. 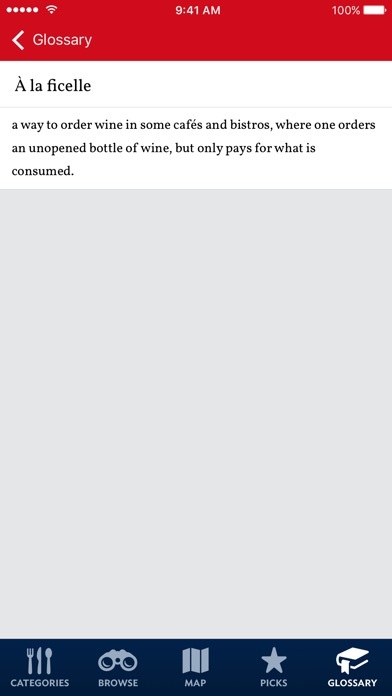 Can see whole page only on iPhone setting (1x). No response to touchscreen. This app does not open initially. I turned off my iPad and then I was able to open it After that I cannot change pages. It works ok with iPhone. I'm a huge fan of Patricia Wells' writing and own several (OK, three) of her books, so when in Paris for two weeks, I was excited to discover her app. Very disappointing, not for her words, when I could get to them, but for the functionality of the app. Doesn't rotate on the iPad, wants to show a landscape view in portrait mode. Buttons are unresponsive. The content is kept up to date, but the basic operation doesn't get fixed. I doubt that the developer ever looks at the app on an iOS device. Wells' writing and criticism deserves a better presentation. I couldn't have lived without this app in Paris. I have the book as well and even though I read the book cover to cover I found the app essential for "on the ground" use. I didn't purchase cellular data for my trip but the app works without it and so does the map (even in airplane mode) so the ability to see where I was in relation to all the places detailed in the book itself was a game changer. So glad I spent the 5 dollars on this app even though I had purchased the book as well! Thanks Patricia!